Myongji Hospital CEO and Chairman Lee Wang-jun (right) and David Hayes, medical director of MCCN, hold a plaque commemorating Myongji’s joining the network, during a news conference at Conrad Seoul Hotel on Tuesday. 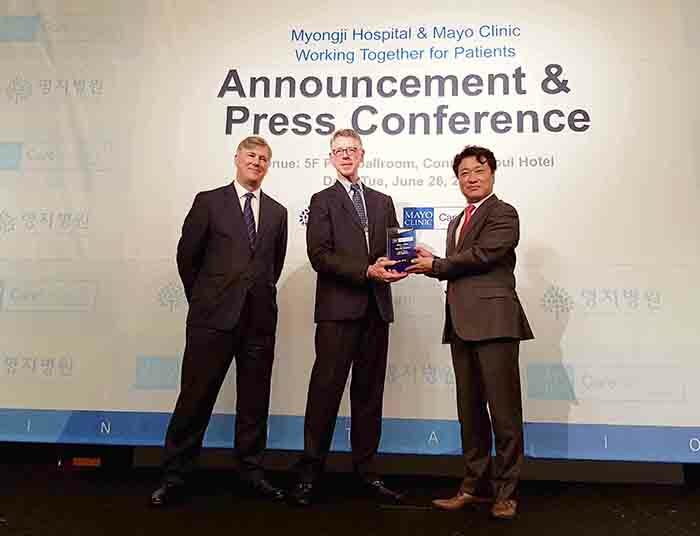 Myongji Hospital announced that it has become an official member of the Mayo Clinic Care Network (MCCN), during the Myongji International Cancer Symposium at Conrad Seoul Hotel on Tuesday. The Mayo Clinic Care Network, which started in 2011, is a collection of independent medical institutions that have been selected by the Mayo Clinic after undergoing a rigorous validation process to allow the exclusive use of Mayo's knowledge, expertise and resources. The MCCN consists of more than 40 member organizations in the U.S., China, Mexico, Philippines, Saudi Arabia, Singapore and the United Arab Emirates. While remaining independent, the members share a common goal to improve the delivery of healthcare. Myongji has now become the fourth Asian and the first Korean Hospital to join the esteemed network, hospital officials said. As a member of MCCN, Myongji can use Mayo’s clinical data to improve the medical service provided to the patients through the official collaboration with the latter. Such clinical resources include AskMayoExpert, eConnect, Boards, healthcare consulting, symposiums, continuing medical education, and use of patient education information. The Korean hospital’s medical workers can get advice about diagnosis and treatment of patients' disease through 'AskMayoExpert' system, which is the Mayo Clinic’s guide database of diagnosis and treatment information. They will also be able to ask the Mayo Clinic for an e-consultation on their patients. Through this agreement, patients at Myongji Hospital can receive a higher level of treatment with no additional costs even if they do not visit the U.S. Myongji Hospital can also request a medical consultation to the Mayo Clinic if the patient wishes so. “Now, Mayo Clinic is open to all patients in Korea through Myongji Hospital and Korean people can receive the best medical care through real-time cooperation between the two hospitals,” Myongji Hospital CEO and Chairman Lee Wang-jun said. “The joining in the MCCN is not just to interact among high-level officials but more like cooperation between brother or sister hospitals." Mayo Clinic also showed high expectations regarding Myongji’s joining its MCCN network.